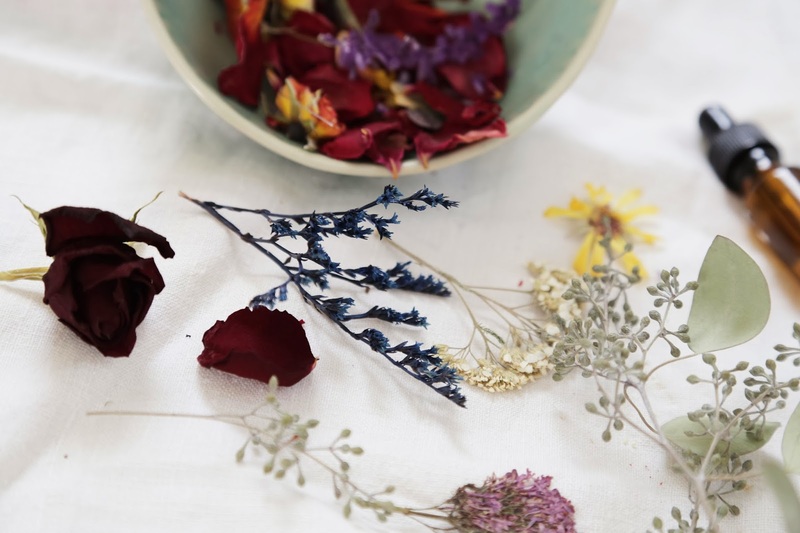 i have been hoarding dried flowers for as long as i can remember. i find them in nooks and crannies all around my home, in books, lost pages, drawers, little boxes, tucked away in dress pockets, etc. perhaps it's because i can't let go or because i find them fascinating and a whole other level of beauty, but no matter what it is, i know my love affair with them is permanent. this is a perfect and simple gift you can make for for all the beautiful ladies (and men! think ferns, rosemary, pine) in your life. 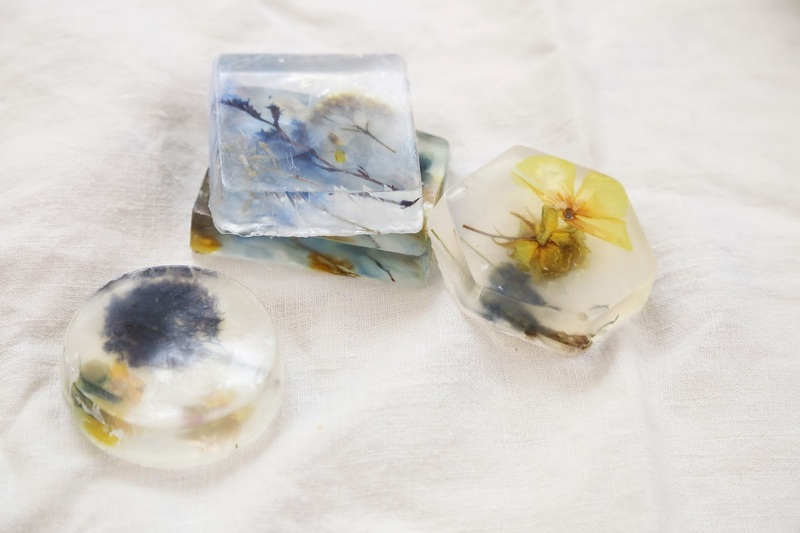 lay your flowers in whichever arrangement you like at the bottom of your soap mold. next, cut your soap base into smaller pieces and microwave for 30 seconds, and then 10 second intervals after that until fully melted. let cool for a few seconds to avoid bubbles. add a few drops of your favorite oils and then pour into the mold slowly and carefully, trying to avoid large bubbles. 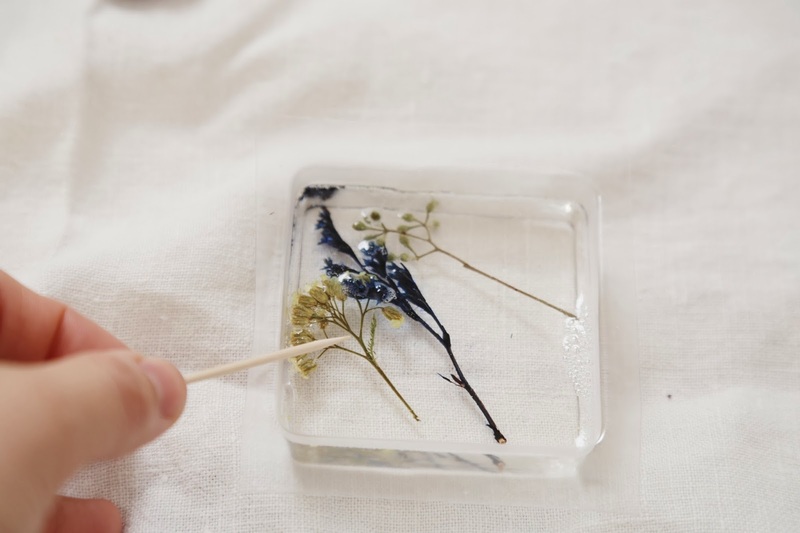 the flowers will most likely float to the top, so use a toothpick to arrange the petals however you like. after 20 minutes or so, check on the molds and if the flowers have floated to the surface, add a bit more melted base to fully cover. if you are adding a touch of glitter, add at the same time as the flowers. let cool for at least an hour before removing. it may take a little tender force to get the soap out of the mold ~ try using a sharp knife and going around the edges slowly until it pops out. just be sure to trim off any excess. These are so pretty. I have never seen a 'how to' for making them either. So thank you. who knew this could be so easy? I love how you described your stash of flowers. I can just see them tucked away in secret hiding places around your home. How lovely! Lovely idea, I definitely have to try this sometime! 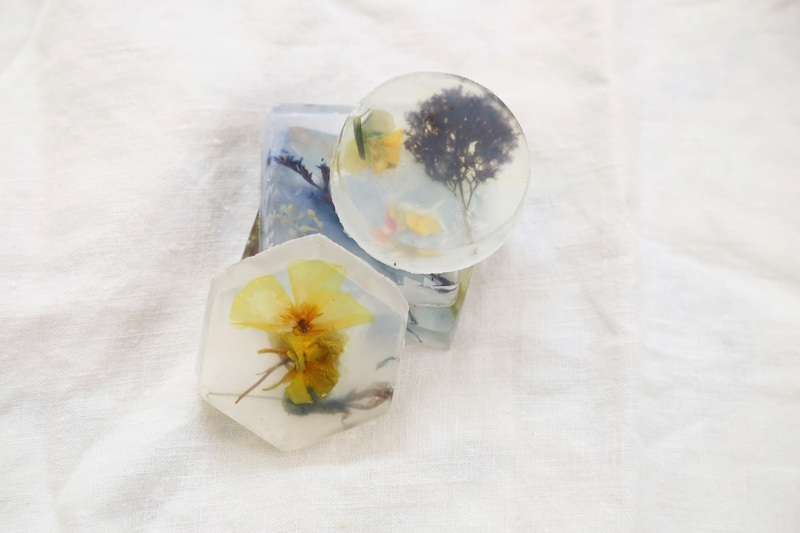 Kerrie Moon, Lady Luna, I've been scoping your Instagram shop and now your blog and everything is so, so beautiful! Thank you for your kind words on Instagram land today. I'll respond soon but was letting your beauty and words sink in. Such a lovely soul. في جمهورية مصر العربيه الان سوف تجد خدمة علي اعلي مستوي التسويق الالكتروني من خلال شركة سوقني للتسويق الالكتروني المتميز علي اعلي مستوي من الجودة في العمل . مع توكيل صيانة كاريير يمكنكم استبدال اي جهاز قديم باجهزه جديد علي اعلي مستوي واقل الاسعرا الان علي جميع قطع الغيار الاصلية . افضل رحلات متميزه الان في جمهورية مصر العربيه حجز فنادق الغردقة علي اعلي جودة في العمل استمتع الان بالخدمات المتميزه علي اعلي جودة في الشركة الان استمتع بالكثير من الطرق المتميزه . خدمات متميزه في شركة مصاعد ومتميزه علي اعلي جودة وباقل الاسعار وخصومات كبيره جدا في العمل علي يد اكبر متخصصين في المملكة . أرخص شركة مكافحة الحشرات بمكة هي شركة العنود التي تقدم لكم عروض خدمات مميزة و خصومات هائلة بجميع أنحاء المملكة العربية السعودية. أفضل مستوي خدمة صيانات سوف تحصل عليها من خلال شركة صيانة ال جي المعتمدة و التي تعتبر من أكبر مراكز الصيانة. خدمات متميزة من خلال فريق الإخلاص و الآمانة المتخصص في مجال نقل اثاث مكة علي أعلي مستوي و بجميع أنحاء السعودية. خدمات علي أعلي مستوي في مجال ابادة الحشرات يمكنكم الآن الحصول عليها بالمملكة من خلال أفضل شركة مكافحة حشرات بالجبيل و هي أبراج دبي المتخصصة. تواصلوا الآن مع مركز النور للحصول علي أفضل كورسات معادلة هندسة و التي تقدمها لكم فريق مختص ذو خبرة واسعة بالمجال علي مدار سنوات. تمتعوا بأفضل العروض التي تقدمها لكم شركة سوقني في مجال تصميم موقع الكتروني علي أعلي مستوي حيث تقدم خصومات مميزة لجميع العملاء. مع افضل شركة نقل عفش بالمدينة المنورة يمكنكم الحصول علي أرخص خدمات نقل عفش من خلال فريق مختص يقوم بفك و تركيب العفش بكل حرص و دقة. We the biggest background removal, clipping path service provider. As images of products are the biggest weapon for a business company. Perfect clipping path service means a lot to this professional business purpose. Do visit to have more knowledge about our unique service.